Nevada has a few dive opportunities to offer. Lake Mead and Lake Tahoe are included in that list. 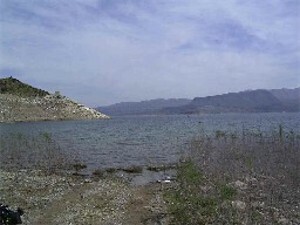 Lake Mohave can also be included, but is more easily accessible from Arizona, so it gets classified there. Said to be one of the top ten freshwater dive sites. Maybe it is, but so far we haven’t experienced that. We’d definitely rate it in the top ten of the southwest, but not in the nation. Lake Mead does have decent visibility for a fresh water lake. We’ve had 20 feet consistently during our various trips that way, and we’ve been there at many different times of the year. 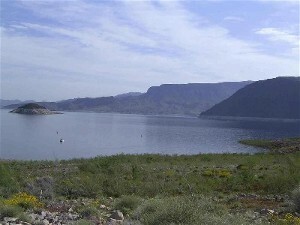 Lake Mead has a dedicated Scuba park. When it was first set up, several boats, tires, etc. 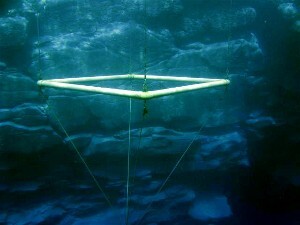 were placed underwater as dive attractions. Many of them have been relocated or removed (see two paragraphs down). 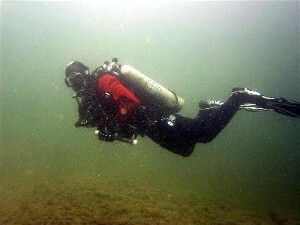 We have only done shore diving at Lake Mead at the Scuba park. We’ve checked out different shore sites, but weekends typically bring out fishing poles and other accessible sites usually have a few fishing lines and hooks hanging in the water. Fishing and boat traffic is not allowed in the Scuba park. We have looked into boat diving, but no one is ever running dive boats when we’re there. In fact, it seems that dive boats go out rarely there, so unless you have your own boat, or are willing to pay a couple hundred to rent one for the day, you’re out of luck. There are some websites that list locations of various attractions that have been sunk there, but some of those have been relocated due to the dropping water level. On the dropping water level: Over the past few years, the water level at Lake Mead has been dropping constantly. The lake has been about 100 feet below full for some time now and doesn’t look like it will be rising anytime soon. This has caused many of the attractions in the scuba park to be moved. The last few times we’ve been there the only attractions left were a sailboat and fish habitat. 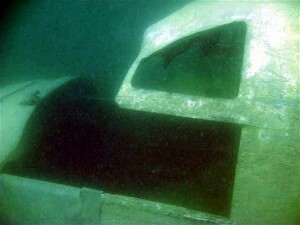 There is a B-29 bomber submerged in the lake. When the lake is full it sits at about 220 feet. Right now it’s almost within recreational limits. One problem though – the entire area around the bomber is restricted until January 2006. This may be extended as it has been in the past. Check out this site – B-29 Superfortress Bomber for more information on the it. 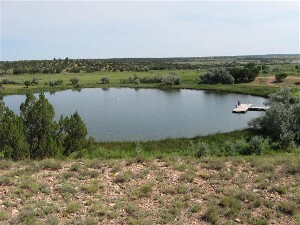 New Mexico has a few dive sites located throughout the state. The most popular dive site is the Santa Rosa Blue Hole, which is visited by divers from New Mexico, Colorado, and Utah on a regular basis. In the southern part of the state, you’ll find Elephant Butte and Lea Lake (information coming soon). 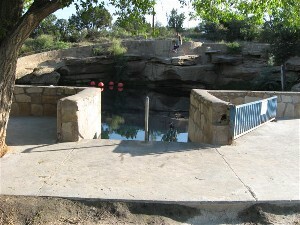 The Santa Rosa Blue Hole is located in northeastern New Mexico about 1.5 hours east of Albuquerque. 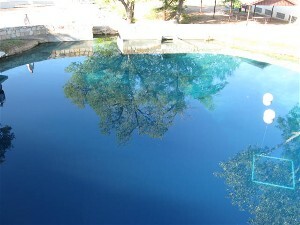 The Blue Hole is fed by a spring head 86 feet below the surface of the water. According to the city, the water flow is 3000 gallons per minute. You can see the water flow at the top of the hole where it flows out into a stream. However, we weren’t able to feel any kind of flow from the spring head. We have seen claims of the water temperature being 61 degrees and 64 degrees. Our computers recorded a water temperature of 64 degrees when we were there. 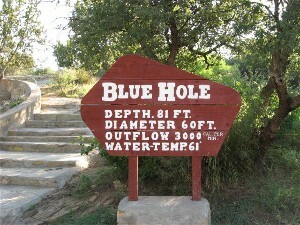 The Blue Hole is 60 feet wide at the top and 80 feet wide along the bottom. At the spring head, the depth is 86 feet. Opposite the spring, the depth is 71 feet. The elevation of Santa Rosa, NM is 4600 feet above sea level. This means that at the deep end of the basin, theoretical depth is greater than 100 feet. 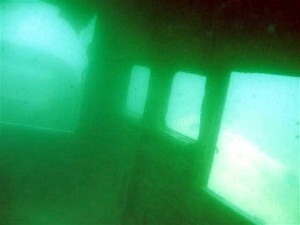 Visibility in the basin is 80 feet before any divers get in the water. 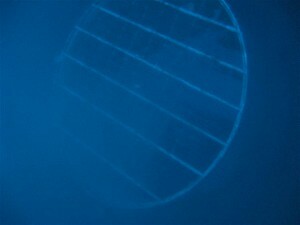 Once divers have been in the water stirring things up a little, the visibility drops down to about 40 feet. 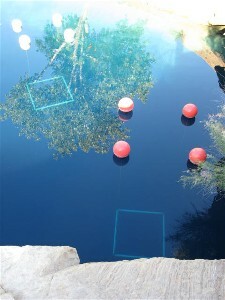 The city has suspended a couple of training squares at 20 feet depth. You’ll also find a variety of fish and crawfish, along with small statuettes that divers have placed on the rocks along the wall. The spring does lead to an underwater cave system, but due to divers not trained in diving overhead environments dying in the cave, it has been grated off by the city. To get to the Blue Hole, turn north off of Route 66 just east of Interstate 40, next to the dollar store. Drive past the swim lake/park until you come to the Blue Hole sign with an arrow pointing to the left. Turn on that road and you’ll see another sign for the Blue Hole pointing to the left. Get there early on weekends to get good parking. When booking a room or campsite, make sure to mention you’re a diver. 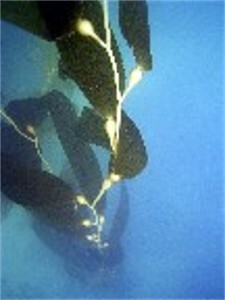 Many of the local hotels/campgrounds offer a discount to divers. 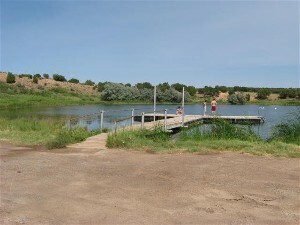 Perch Lake is located less than 10 minutes from the Blue Hole. It’s a small lake shaped like a bowl. Because the lake is so small and contained, there is a strong odor of sulfer and methane coming from the water. This also keeps the visibility at around 15′ at best. There’s a pretty steep slope that drops down to about 50 feet depth in the center. There is a dock that takes you out to water that is about 15 feet deep. If you stand on side of the dock opposite the steps back onto the dock and set a heading of 90 degrees on your compass you will find a submerged airplane. 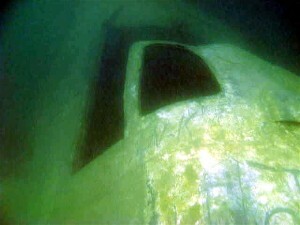 The left wing of the airplane is at around 20 feet depth with the nose of the plane at about 35 feet depth. The inside of the airplane has been gutted out to reduce entanglements. However, the airplane is a small two-engine six seater with littl room in there. It’s not advised that you do a swim through unless trained in overhead environments. 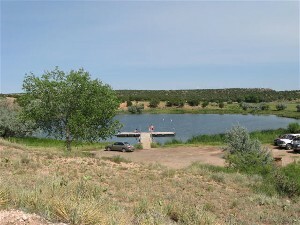 The lake also has a training square in the center, as well as a submerged car. 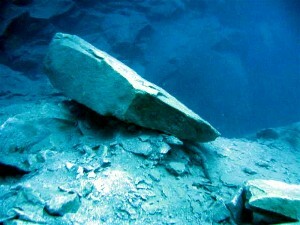 For an idea of how small the lake is at a depth of 20 feet, it took about 12 minutes to swim the perimeter of the lake. San Diego is the only place in California we’ve visited so far. 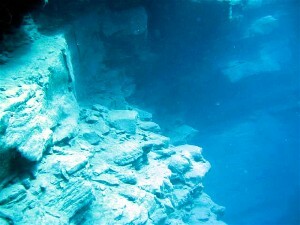 There are lots of sites to dive there, both from shore and from boat. We’ll be heading out to Catalina sometime in 2007 and will add information about the island after that trip. In the meantime, enjoy everything San Diego has to offer. San Diego is at the southwest corner of California. It offers up some decent diving. Warning: the water is cold! So, if you’re not used to temps in the 40s and 50s, don’t bother. That is, unless you plan on staying shallow. 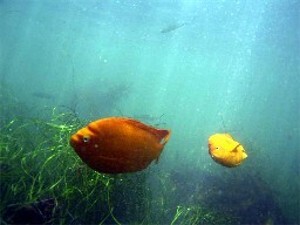 San Diego waters have a thermocline about every 20-30 feet, depending on where you’re diving. 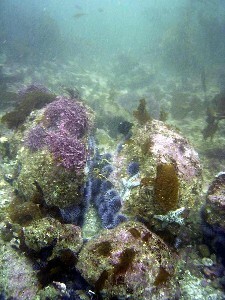 You can dive some of the shallow coves and stay in the high 60s as long as you don’t go deeper than 18-20 feet. Beyond that, you’re hitting the low 60s. Below 50 feet, count on temps in the 50s. A lot of people dive San Diego waters wet. For us, it’s dry all year round. 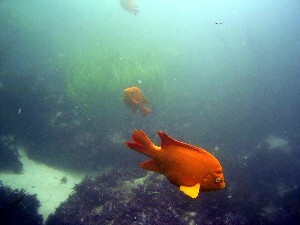 San Diego offers some decent dives in the wreck diving category. 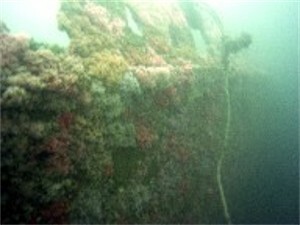 While a lot of the wrecks off the San Diego coast were intentionally put there, some, such as the Yukon, decided for herself how she was going to go. These wrecks are also fairly close to the marina, so you don’t spend a lot of time getting to them. 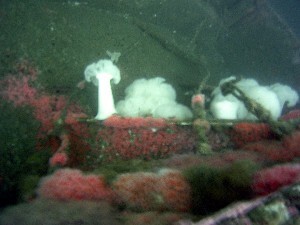 Many of the wrecks sit in the 40-120′ levels. You can also find several beyond 130′ if you’re trained for those depths. 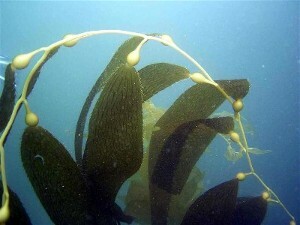 San Diego is also surrounded by kelp beds, which offer up a lot of marine life to see. During the right time of year, it can feel like your flying through a forest of trees. If you’re feeling a bit adventurous, try overcoming the surf during a shore entry. It’s actually not too bad getting in. It’s the getting out that can be challenging. If you haven’t done much shore diving before (ocean shore diving, that is), then make sure you do with someone who can guide you through this experience. Then top it off with a long surface swim to get to the sites. Okay, so the shore diving may not sound too enticing, but it can actually be a great experience. Just make sure you know what you’re getting yourself into before you attempt it. Once you make the decision to do it, you’ll find it to be well worth it. 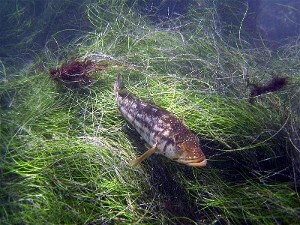 There is a lot to see once you get past the surf and the surface swim. 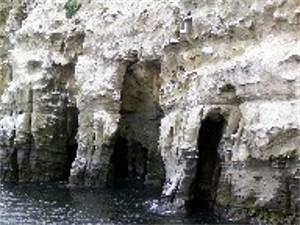 There are also caverns that were carved into the cliff by the wind and tides that can be seen both from La Jolla shores and La Jolla Cove. The only way to really get to them is by boat, unless you really like to surface swim. Be careful, though, because changing tides can make it dangerous. We recommend not diving near them without a local guide. 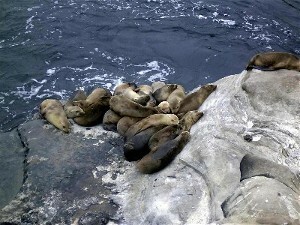 After you’re done with your dive at La Jolla Cove, head south along the shoreline until you come to Children’s Pool. 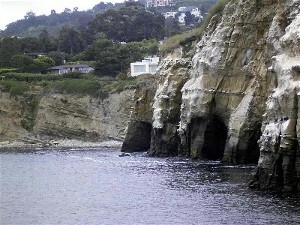 This is a small cove that was created back in the 1930s. 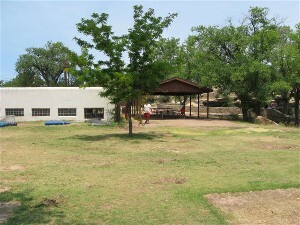 A wall was built here to create a safe place for the children of San Diego to play in the water. 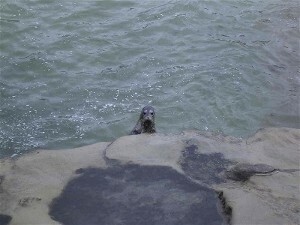 Since that time the seals have taken over the cove and the beach there. At times you can’t even walk on the water because there are so many seals laying on the sand. You can also expect to find a seal activist sitting there with a sign trying to disuade people from walking on the beach there. There’s no law against walking on the beach. You just need to make sure you keep your distance from the seals, if they’re there. In our opinion, the activist could use the time there more productively by picking up the trash on the sand. Go ahead and walk on the wall out to the end. You might have a seal pop it’s head up out of the water while you’re there. 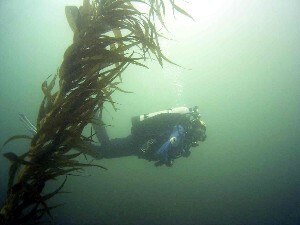 So overall, the diving in San Diego is good, when the conditions are right. Just be prepared to dress appropriately for the temps and do your first shore entry with someone experienced in it.